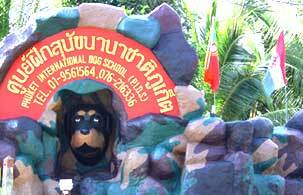 Welcome to Phuket International Dog School. We are a positive reinforcement dog school. We offer dog training classes for all breeds and all sizes. The training classes we offer are: Puppy Kindergarten Class, Basic Obedience, Advanced Basic Obedience, Agility, Flying disc, Security Training, and Trick Training. We also offer private consults for behavior modification, aggression (dog-to-dog aggression, dog-to-people aggression, and all other forms of aggression), problem solving, agility, and more! Group classes and private consults are held indoors in an air conditioned/heated building, however agility and Flying disc are held outside on our fenced and lighted one acre field. All techniques used by Phuket International Dog School. Instructors are dog friendly. We do NOT use prong collars and all training is fun. All of our instructors are certified or pursuing certification. Further, we love to invite you to enjoy our dog show every Sunday 5pm. Please click here for the sample.